The hop will run for 1 week and end on Friday 8th March at 12 Noon EST, when the lucky winners will be announced right here. 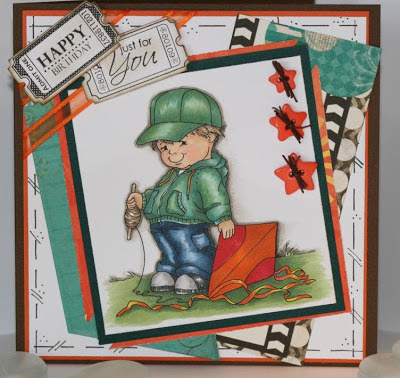 Here is my creation for the Blog Hop. I used a Digital image created by Crissy's Digis. A great summer birthday card for a young boy, Makes you wish summer would come faster. I started off coloring this image in the BG copic colors but found some green patterned paper that I really though was a great boy color so then blended in a green pallet. So the hoodie took me a bit of time to color but I like the final product. A closer look at the colored image. Supplies: Copic markers, Bo Bunny Patterened paper, Whimsy Stamps : Treasured Moments, Friendship ticket Stamps, and Ticket Dies cut, MIscellaneous buttons, Offray ribbon. Thank you for stopping by and playing along with us at Whimsy. That little guy is SO cute! He is so sweet! Love your card. Great coloring! Such a cute card and image tfs!!! Darling card...and yes, it sure makes me want spring to come NOW!! Aw, little cutie! Your coloring is gorgeous! This is a gorgeous masculine card. Living the colours and design. Enjoying the hop. This is such a beautiful card, and your coloring is fabulous. I'm a follower now also. What a cute little guy and the colors are eye catching! This reminds me of when I was young and also of the song, "Let's go fly a kite up to the highest height". Very cute card. It's great to see another masculine image. One of these days I'm going to be able to color like this. Your coloring is terrific!!! Great layout and really unexpected colors. I'll be back to see what else you've done, for sure! Cute! It's so nice to see more little boy digis! Super cute card! That image is just adorable. Great job coloring and nice design, TFS! Another fine creation you've made! I love the colors, and fun image pretty cute! WTG!